Note: Dark Trajectories: Politics of the Outside is a compilation of recent philosophy that I organized and edited. It was published in 2013 by [NAME] Publications. This is the introduction that I wrote for that volume. 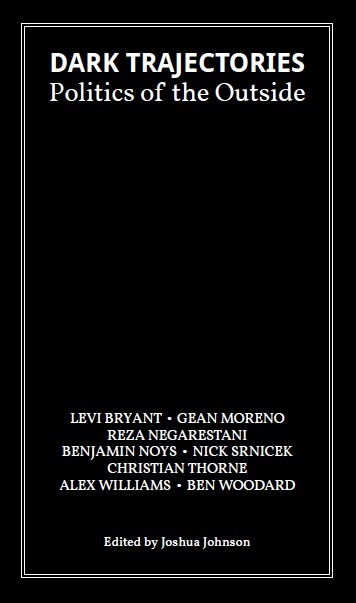 Contributors included: Levi Bryant, Gean Moreno, Reza Negarestani, Benjamin Noys, Nick Srnicek, Christian Thorne, Alex Williams, and Ben Woodard. Available through [NAME] Publications and select retailers. The crisis in contemporary capitalism and the continuing failure of the neoliberal imagination seem to forestall any solutions. Rather than questioning the wisdom of further financialization and deepening inequality, the leading technocrats are embracing austerity and doubling-down on the spirit of market-fundamentalism that lead to the economic crises of 2008 and the ongoing euro-crisis. The last thirty years of critical theory have also failed to provide a significant challenge to the dogmas of neoliberalism. As market logic has embraced ever widening aspects of the social, the naturalization of capitalism has made the epistemic limits of critical theory ever more apparent. Those theories, as they have clawed at the limits of the social continuum, have ironically succumb to the very economic analysis they were meant to defy – the cost of resistance in the face of dwindling resources not yet subsumed by capital made their claims to real alternatives disappear into a recursively formulated critique. Without a robust consideration the real, or a re-consideration of the Kantian assumptions of access, any escape to beyond the efficacious operativity of capitalism has seemed impossible. With the rise of Speculative Realism, Object Oriented Ontology, and other realist projects there has been a turn away from anthropocentrically hardened philosophies of the last thirty years and a re-consideration of the outside. This new perspective entails new resources and complications for any political philosophy, which this compilation explores from a variety of views. Certainly the question of politics has been central to the spirit of these new philosophies from the beginning. A radicalized Deleuzianism, epitomized by the work of Nick Land, but engaged both positively and negatively by many of the contributors in this volume, made the driving forces of capitalism a central point of contention. The political thesis of Land’s work, that capitalism’s experimental puissance may be collapsed with an ontologized death-drive which will propel capitalism beyond its own limited political vocabulary, has challenged others to confront new strategies for re-configuring the political imaginary. Gean Moreno proposes a metaphorical relationship between the apocalyptic sci-fi “grey-goo” nano-tech mythology and capitalism, developing this story to begin to think an alien and othered capitalism whose purposes overlap, but are not necessarily aligned with those of humans. He questions whether the energies unleashed by capitalism might not be simply contingently negated, but diverted into new strategies of resistance. Benjamin Noys coined the term ‘accelerationism’ to describe the type of hyper-capitalist logic favored by Land. In The Grammar of Neoliberalism, Noys confronts Land’s naturalization of the neoliberal logic. Like Moreno’s “grey goo” analogy, Noys’ regards Landian acceleration as apocalyptic. Capitalist acceleration exasperates the hyper-efficiency imposed by market logic and speeds up its processes of ‘creative destruction’, butchering all elements of the social to fit into the machine logics of market economics. However, as Noys argues, this systematic and mechanistic application of market forces effectively reduces the revolutionary capacity of any agent to another cog in the capitalist machine. The horizon of his or her activity becomes commensurate with that of the neoliberal project itself. Reza Negarestani’s text investigates the strategy of openness and its relationship with death to radicalize the implications of an accelerationist thought. The question of an outside is a central one to a capitalist system which must always posit the affordability of its own horizon in excess of its limits. The capitalist must insist upon the profit as its own transcendental limit, denying openness in favor of an externalized outside to be consumed. Rather than capitalism’s creative-destruction, Negarestani examines the process of necrophilia (the becoming of life into death, and death into life) which is never exhausted or contained by any program. Instead of viewing the outside as a raw resource for the expansion of the body of capital, germinal death infects the body of capitalism, turning it into a feast for the unbounded un-life which opens the inside to its continuous extensibility. Capitalism, or any transcendentally limited project, is always subject to trajectories beyond its own ideological value assumptions. Ben Woodard begins a survey of the contemporary environment, and like Negarestani, questions the opposition between two molar oceanic forces, that of the liquidity of capital and the desiring flows of nature. He characterizes capitalism as a violent masculine force that attempts to hegemonically divert all flows to its purposes, strangling the diversity of the ocean. There is however, the feminist force of the ocean, whose strength lies in the diversity of its experiments, which cannot be contained by the bounds of capitalism’s affordability. Woodard proposes that, as theorists, we must decouple the violence and struggle of capitalism from its essential boundedness, and recognize that these strategies are also political tools for the unbounded ocean. Christian Thorne tackles the problem of essentialism in another way, critiquing the political ontologists who would couple the affective spirit of their political program with being itself. In this we see shades of Noys critique of Land, in which the machinic efficacy of capitalism becomes a deterministic program. Thorne applies the images of water and fire, and shows how a naive ontologization of their qualities as pure necessity leads to theology. He questions whether any speculative ontology can truly escape the epistemic and ideological limits of its author. Levi Bryant looks at the critique of a political ontology from a different perspective, decoupling the notion of what “is” from what “ought” to be. He argues that philosophers have a responsibility to examine what “is”, that is to map the various beings of the world, as they are, whether they agree with our ethics or not. Yet, he also thinks that it is also possible to maintain an ethical-political program that embraces and adapts the various critical perspectives from Marxism, Feminism, etc. to continue to shape the landscape that a considered ontology may uncover. Nick Srnicek and Alex Williams engage with the form of the manifesto to revive a project of Marxist accelerationism. They critique both the exhaustion of neoliberal ideology and a reactionary leftism, while proposing a new political imaginary. They envision a decoupling of technology from its instrumentalization by capitalism, while demanding a shift away from what they characterize as an ineffective horizontally organized and localized politics. They believe the liberation and utilization of the techno-sciences coupled with a cunning use of politics will revive the political imaginary of the future.